"Aztecs in the Philippines IV" was held at The Sequia Recreation Center, Buena Park California, on Friday August 25th.This time we were invited by the Plastic Modelers Society, Orange California Chapter. During their monthly meeting. This event was different to those we had before. 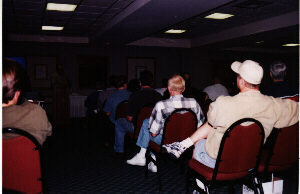 Because of the limited amount of time we had, it was not possible to address the atendees. We shared the display and the video presentation we have. After this the meeting had a recess, time that Mr. Hoyo spent aswering questions to those who were more interested. Here are just a couple of pictures of this event. "Aztecas en Las Filipinas IV" se llevo a acabo en el Sequia Recreation Center en la ciudad de Buena Park, California. Esta vez fuimos invitados por La Asociacion de Modeladores de Plastico del Condado de Orange, California. Durante su junta mensual. Este evento fue muy diferente a los que hemos tenido antes. Debido al tiempo tan limitado que nos dieron, no fue posible dirigirnos a los asistentes. Les presentamos las fotografias y el video que tenemos. Durante el descanso los mas interesados acedieron al senor Rene Hoyo con muchas preguntas, como es costumbre en nuestros eventos. Hopefuly you are able to see something here, I'm stil have trouble learning how to scan pictures. But anyway, here is the presentation of the program, to aproximately seventy members, by the President of the IPMS, Orange County. Espero puedan ver algo aqui, ya que todabia estoy aprendiendo a manejar el escaner. Pero si pueden veran el momento que el presidente de IPMS Orange County, nos introdujo al los casi setenta miembros que asistieron a la junta. 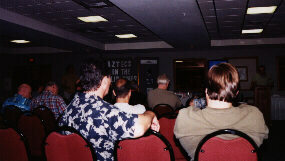 In this other picture, as the program got on its way, the members were paying attention to the video presentation. During the recess many mention how impressed were about the facts they learned tonight. En esta otra toma, ya cuando el programa comenzo, los miembros estuvieron muy atentos a la presentacion del video. Despues, durante el descanso muchos de ellos mencionaron lo impresionados que estaban de haber aprendido acerca de esta nueva informacion.